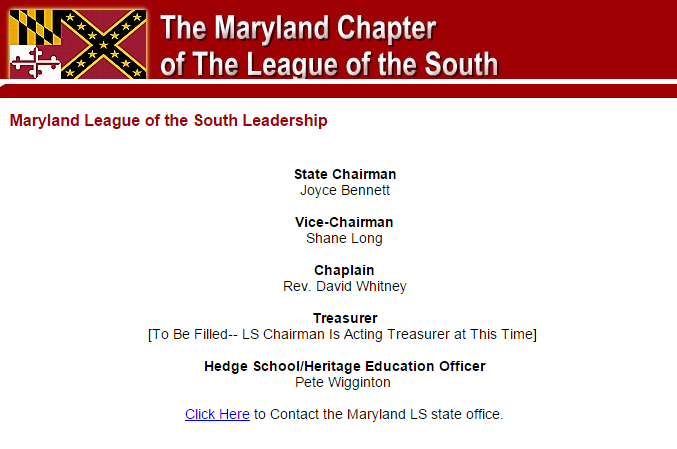 One of the leading white supremacist organizations in Charlottesville was the League of the South. The leader of the group is Michael Hill. 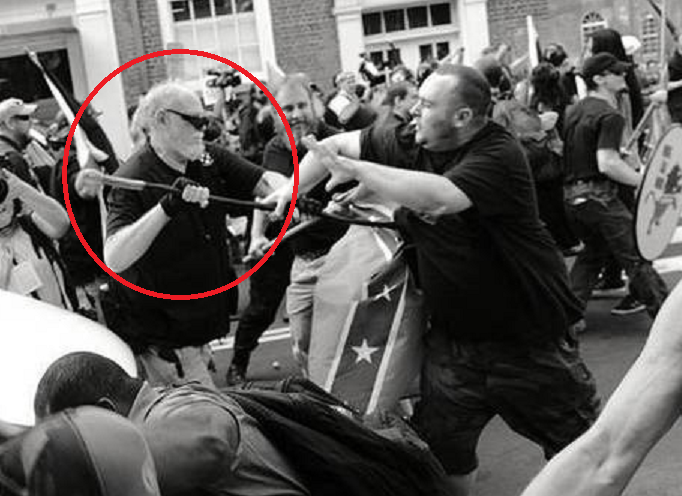 You can see him circled in red below fighting his way toward the Lee monument last weekend in Charlottesville. Over the past several years, the League has become more clear in their white supremacist positions and become openly aligned with neo-Nazis and the KKK. This was demonstrated in Charlottesville by their participation in Unite the Right. Hill has a history or writing incendiary posts for the League of the South website sometimes coming close to calls for violence. In 2014, Hill penned a description of what 4th Generation warfare would be like. Given their promise for more demonstrations to come, I think it is fair warning to reprint that description now. 4Gen Warfare doesn’t require that the populace be armed equal to the military and law enforcement. In fact, having such firepower, with few exceptions (such as full-auto “assault weapons,” silencers, and a handful of other esoteric toys), would be a logistical and tactical burden to the common 3- to 5-man group so common in this type of warfare. Stealth and the concentration of firepower at certain points for a short time are the keys to successful Gen4 Warfare, whether it’s busting up a traffic roadblock, ambushing a gun confiscation raid, or taking down a high-profile tyrant. If you want more from an historical standpoint, read about Michael Collins. If you want more from a modern, practical standpoint, read Joseph P. Martino’s Resistance to Tyranny: A Primer. After Charlottesville, the League has taken on a victim mentality. They, along with other white nationalist groups, came to Charlottesville heavily armed. I am surprised more people were not hurt. I think these groups should be monitored. If they begin to feel they are in a war, then Hill’s words might give clues to their next moves. The League of the South had a good day in Charlottesville, Virginia. Our warriors acquitted themselves as men. God be praised! Despite claims from some League of the South members that they were non-violent, pictures taken at the scene appear to contradict that story. Below League of the South members clash with counter-protesters. In the center of the action appears to be League president Michael Hill. When one examines the person in the red circle, it looks a lot like LoS president Michael Hill. This Twitter user took several photos worth examining. Click here to follow his twitter account. Even as white supremacists are reveling in their “successes,” I hope the ugliness of their actions will turn the general public against their goals and lead to the removal of more Confederate icons. You would think that Donald Trump would have learned something from his KKK-David Duke snafu over the weekend. Trump gave press privileges to James Edwards, host of “paleo-Conservative” radio show Political Cesspool on February 27. Despite Edwards protests to the contrary, his guests and show topics place him in the white segregationist “we [whites] need space too” category. Furthermore, Donald Trump, Jr. is slated to appear on the program with Edwards this weekend on March 5 (the interview has already been taped). As I understand it, this story was broken first by the blog Little Green Footballs. A tweet about Edwards reminded of an appearance on his show by Michael Hill, League of the South president. Edwards regularly has Hill as a guest. During one such appearance, Hill defined Southerners as whites with Edwards chiming in whole heartedly. The entire appearance can be heard here. We are for the survival, well-being, and independence of the Southern people. And when we say ‘the Southern people,’ we mean white Southerners. We are an ethno-nationalist movement and we want a free and independent South for our people, as our homeland and that’s pretty much what we are fighting for. Then why get into immigration protests? Now we’re doing the demographic displacement demonstrations to help with that first thing I said, the very survival of our people because if we don’t control the land, the soil with our blood, then we don’t have a place to live, we don’t have a place to work, we don’t have a place to worship, and raise our children. So the survival of our people on our land is the first thing that we’re concerned about. And that’s why we’re having these rallies against our demographic displacement. But in the end, we want a free and independent South. We’re Southern nationalists; and as I said, we want an ethno, we’re ethno-nationalists, and we want an ethnic state for Southerners here. It’s is just as legitimate folks that white, Christian Southerners have an organization that seeks to advance their unique group interests. They’ve got the radio show, they’ve got this organization and it’s completely legit and above board because I’m telling you what Dr. Hill is doing is very serious work on very serious issues and causes. Everybody ought to have the right to live and thrive and have a home and a land of their own and I do mean everybody, including white Southerners. Edwards protests that he is not a white supremacist. He certainly is a white segregationist since he is referring to a land for white people without individuals of other races. I must admit that this rally lived up to my expectations. I’ve been saying for years on the radio that the majority of Americans fundamentally agree with us on the issues and that the neocons were generals of a phantom army. I am being proven right. Our people just needed a viable candidate and they’ve identified Trump as that man. There is no doubt that Trump’s populism and nationalism is galvanizing our nation and may change the course of American history for the better right before our very eyes. Edwards also says his press credentials should not be construed as an endorsement by Trump. To me, that doesn’t fly. If Edwards tried to get press privileges with any other campaign, I cannot believe he would be allowed in. Todd Starnes is all peeved at people who are bothered by symbols of the Confederacy. I just posted his ridicule of the Fort Smith school board. A review of his twitter account and recent columns leaves no doubt that Starnes believes that all the fuss is coming from the evil left (like John Kasich, Mitt Romney, and Russell Moore). Stalin and Lenin would be bursting with pride. You know who else has been doing some cultural cleansing? The Islamic State — bulldozing their way through history — turning Iraq’s heritage into rubble. 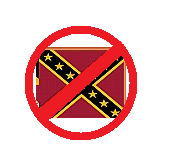 And mark my words – the left’s cultural crusade will not stop with the Confederate Flag. They will use the perception of racism and hatred to whitewash history and silence dissent. And one day – very soon – I predict they will come after another flag — the one with broad stripes and bright stars. So don’t be terribly surprised when even Republicans stand idly by as they burn the Star-Spangled Banner. Because getting rid of the American flag would be just like getting rid of the Confederate flag. Seriously, it is disturbing that Starnes is using his platform in this manner. He considers removing the flag of the Confederacy from a public building “cultural cleansing,” because as any good defender of Southern culture knows, what is important about Southern culture is that Southern states once fought for the right to own slaves. Indeed, white supremacists and Starnes agree about the analogy to ISIS, as this Occidental Dissent post demonstrates. The Confederate flag belongs in a museum, not flying over public property as a symbol of what the League of the South wants to enact in the present — Southern secession. From our point of view, all Mr. Rogers has done is diligently catalog the facts about the epidemic of black-on-white violent crime in America. We see this as a service that the mainstream US media refuses to provide to the public, thereby endangering the lives of many innocent people. The fact that young Mr. Roof chose to act on this information is no fault of Mr. Rogers or anyone else who tells the hard truths about race that the leftist media regularly sweeps under the rug. To attempt to blame Mr. Rogers, the CofCC, the Confederate battle flag, Southern culture, or the Easter Bunny for causing this murder is the sort of repulsive ideological persecution one used to find commonplace in the old USSR. It is, in a word, shameful.